Since the dawn of civilization, all philosophical, scientific, religious and even artistic works, in principle, have centered around the study of life, its meaning and the origin of the universe. What is life? What is the origin of the universe? Is there any meaning and purpose behind the manifestation of life and the universe? What is the unseen cause behind the manifestation of the perceivable universe? These questions have puzzled all the great thinkers around the world over the ages. Vedanta, the topmost scientific and philosophical treatise of Indian spiritual and cultural heritage has a lot to contribute in this area and could provide a vital leap in expanding our knowledge of life and the origin of the universe. 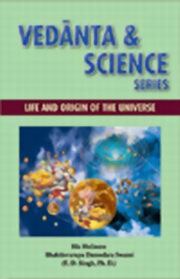 In this unique book, His Holiness Bhaktisvarupa Damodara Swami (Dr. T. D. Singh) investigates life and the secrets of the origin of the universe and depicts the relevance of Vedantic wisdom in the context of modern scientific and technological developments.